NBC’s Winter Olympic coverage Tuesday night averaged a 4.8 adult 18-49 rating from 8:00-11:00 pm, below the same night in Vancouver 2010 (5.5 rating) and well below the same night in Turin 2006 (7.5 rating), which was helped by figure skating. Last night’s events were not exactly marquee: Women’s Giant Slalom, Men’s Halfpipe, Men’s Snowboard Cross, Women’s Bobsled and Women’s Short Track 3000m Relay. 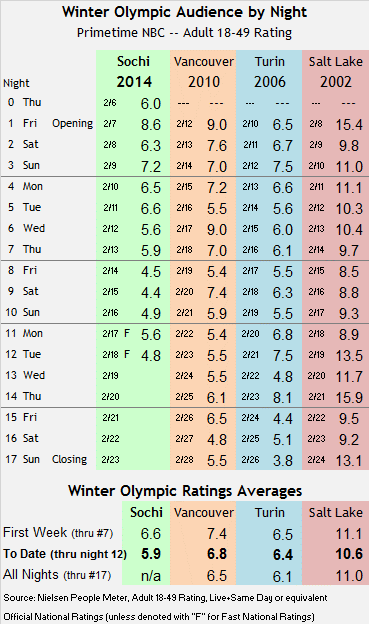 Through the second Tuesday of Olympic coverage, Sochi is now averaging a 5.9 adult 18-49 rating, now half a rating point from Turin 2006 (6.4 rating over the same period) and almost a full rating point behind Vancouver 2010 (6.8 rating). The numbers will bump up a bit tonight and Thursday with the Ladies’ Figure Skating competition, but with no Americans in serious contention for medals it will be nearly impossible to make up much ground over prior Games. These Olympics are clearly a misfire and hardly worth the near $1 billion in rights fees and production costs.